Several dramatic events occur, such as Emily overcoming her fear of driving so she can take care of her sister-in-law Arlene in the hospital, or apologizing to her dead parents for being ungrateful and snobbish, ashamed of her humble roots. But the big plot points are not as important as the minute and quotidian details of her life—what she eats (melba toast and black tea most mornings, splurging on a two-for-one all-you-can-eat buffet every Tuesday at the Eat ‘n’ Park), how she spends her days (“rationed correctly, the [New York Times crossword] puzzle would last her all week”), and what dominates her conversation (whether her children will visit for the holidays). The precise and realistic detail immerses the reader completely in Emily’s world. 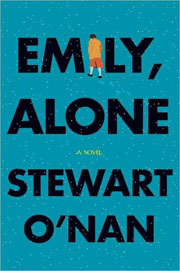 Despite (or because of) its focus on mortality, Emily, Alone is reassuring. If I can be as spry and self-aware as Emily in forty years, as witty and capable of change, as unafraid and matter-of-fact about death, I will almost look forward to getting old.